Paper lanterns are a popular decoration at the moment and they are relatively inexpensive so you can afford to be generous with how many you use. They have almost taken the place of balloons and can be used for birthdays, anniversaries and weddings - really any celebration! Lanterns have mainly been used to hang from ceilings and walls and at weddings they look pretty hanging on chairs on the wedding aisle. But they are now being used for table centerpieces. The simplest paper lantern centerpiece is to have one lantern in the center of the table with a battery light inside (candles and paper lanterns are not good together!) you could then have petals or confetti scattered on the table. If your table is slightly larger then you could have a group of three smaller lanterns in the middle of the table or have a row on a long table. Paper lanterns can also be used as vases! If you want to use real flowers you will need to find a waterproof container or vase that fits snuggly inside the the lantern and then create your flower display so it shows from the top. If you are using the small paper lanterns then you could use a glass jar inside instead of a vase. You could use silk flowers or branches if you wanted to avoid having to fit a vase, however be careful the stems do not rip the paper of the lantern. 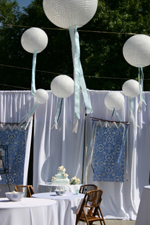 You could also have your centerpiece hanging from the ceiling above your table. It's a good way to create a great impact as your guests walk into the room and it also avoids cluttering up the table. 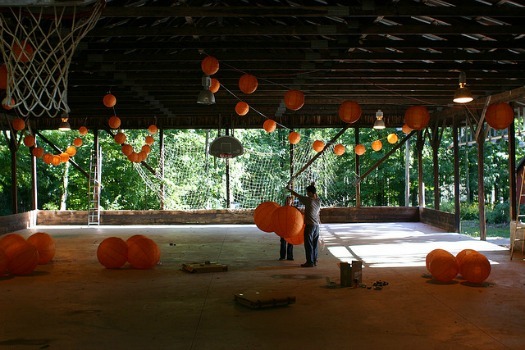 You will need ribbon to hang your lanterns from the ceiling and then tie the lanterns in groups of three above the table at different heights to create even more of an impact. The great thing about using paper lanterns for this display is that they are not heavy and so don't need a great deal of securing to keep them in place. 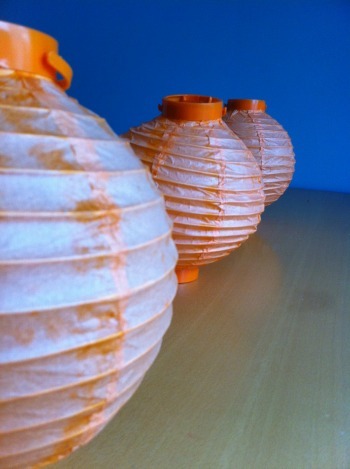 As well as the round paper lantern you can also look at using luminaries for your centerpiece. These are fire retardant paper bags that have a design cut out of the paper so the light can shine through. They come in lots of different colors including white and they create a very magical sparkle to a room in an evening when they are all lit. They can also be used to create an edge to a walkway, maybe for the entrance to a party or for an aisle of an evening wedding.